GREAT WHITE: WHERE IT ALL BEGAN. Open wide for the beer that started it all. The Great White is the original gangsta, and it remains one of our very favorites to this day. Crisp and refreshing, it’s everything you could ever want from a Belgian-style white. Great White is the beer that started it all – it’s the original gangsta. And it remains one of our very favorites to this day. Crisp and refreshing, it’s everything you could ever want from a Belgian-style white. It’s full-bodied, unfiltered, and goes down oh-so smooth. The hint of citrus and coriander sets it apart from other Belgian whites. IBUs: 15 | OG: 1.042. Available in cans and bottles. Let’s just put it this way: If you’re ever going to have an impromptu pool party at a complete stranger’s house, this is the beer you’ll want to be swiggin' when you get caught. Brewed with the perfect balance of wheat and crystal malts, our Tangerine Wheat delivers a perfectly crisp finish for those hot summer days. It’s got that classic Lost Coast wheat flavor, with a kick of citrus to help jump-start the party. IBUs: 15 | OG: 1.047. Available in cans and bottles. What’s cooler than being cool? An ice-cold Downtown Brown, that’s what. Smooth and full-bodied, it’s our signature brown ale, and it’s perfect for anyone who enjoys a beer that’s dark in color without the heaviness of a porter or stout. For such a sophisticated blend, the taste is surprisingly simple. It’s lightly hopped and features chocolate and caramel malts imported from Jolly ole’ England. IBUs: 20 | OG: 1.048. Traditionally, nothing good happens in an alleyway. But then again, Lost Coast Brewery is anything but traditional. Our Alleycat Amber is a full-flavored amber brewed with roasted caramel malts. Rich in color and medium-bodied, it’s an assertive blend that will leave you refreshed and wanting more. IBUs: 12 | OG: 1.050. Our Eight Ball Stout is not for the faint of heart. It’s bold as hell and robust as can be, but it’ll reward your palate like no other stout. Roasted malts and heavy hops give it a flavor that will have you pouring another before you’re even finished with the first. IBUs: 28 | OG: 1.056. Fogcutter is our first true double IPA, and it’s quite the work of art. Yeah, it’s bitter, but it’s supposed to be. And the variety of malt flavors and aroma help balance it all out, as any good DIPA deserves. The bright, citrusy nose is born from the extra dry-hop from Cascade, Centennial, Crystal, Chinook, and Citra hops. IBUs: 70 | OG: 1.074. Available in cans and bottles. IBUs: 59 | OG: 1.061. Hoppy and full-bodied, the Indica IPA was created with the true beer lover in mind. 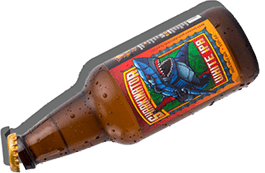 Its high alcohol content is balanced nicely with the radical bittering from Columbus hops, and gets a nice dry-hop finish using generous amounts of Willamette and Centennial hop flowers. IBUs: 50 | OG: 1.059. Much like our Downtown Brown, this brown ale has a smooth, rich chocolate malt flavor that’s nothing if not full-bodied. But here’s the twist: This brown is infused with real raspberry, giving it an aromatic, fruity finish. It’s a great option for anyone looking for something a bit different. Packaged in 22oz. bottle. Think Great White, only bigger and much, much bolder. We’re talking next level sharkage. Sink your teeth into the dry hopped Cascade, Crystal, and Citra hops that get a wonderful citrus aroma and a nice hoppy finish. It’s the perfect beer for anyone who’s not afraid of a little (or big) bite. IBUs: 40 | OG: 1.042. A refreshing watermelon ale that combines our Harvest Wheat with natural watermelon essence for exemplary aromatics while maintaining a light, crisp and refreshing flavors. Brewed with a combination of wheat and crystal malts; unfiltered. IBUs: 20 | OG: 1.047. Available in cans and bottles. Loaded with Mosaic and Citra Hops, the aroma is bursting with citrus and fruit. Notably orange, grape, passion fruit and blueberry come to the forefront. Paired with barley, rolled oats and East Coast Ale Yeast, the texture is silky and refreshing and the appearance is hazy gold. IBUs: 38 | OG: 1.056. A smooth and creamy midnight black stout. Deep rich sweetness with layers of coffee, caramel, toffee, prunes, raisins and roasted peanuts. An easy drinking dark beer, brewed with lactose to give a full mouthfeel and up-front sweetness. Balanced and approachable, for both casual fans of stouts and aficionados. IBUs: 64 | OG: 1.021. Lost Coast India Pale Ale is a smooth, full-bodied, unfiltered ale. True to the style, our IPA has a wonderful flavor that drinks like a session ale, balanced by radical bittering to give a unique pleasant aroma. IBUs: 38 | OG: 1.059.